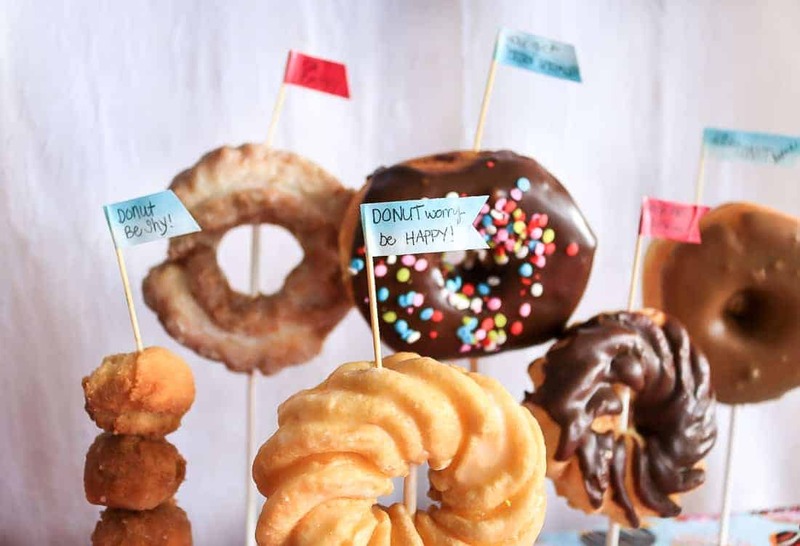 Are you planning a donut themed party?? You’re going to love these baby sprinkle shower ideas! This baby shower was bright and budget friendly, but also simple and easy to recreate. 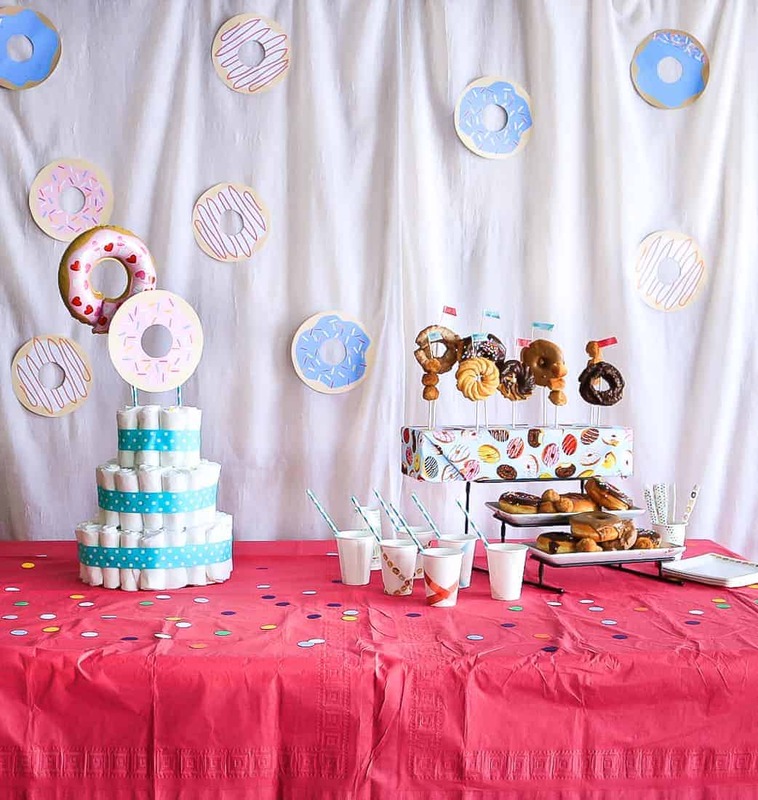 The best part are the free printable donuts that you can print to decorate for your own party! This is a paid post brought to you by Evite® as part of the Evite Influencer Program. The opinions are completely my own based on my experience. Read my full disclosure here. I was so excited to plan this baby shower for my sister, but since it was her 2nd baby and another girl, she didn’t really need much in the way of gifts. When we were chatting about sprinkle baby shower ideas, I mentioned a diaper shower. Of course that sounded like the best option because Lord knows how many diapers you need for little ones! 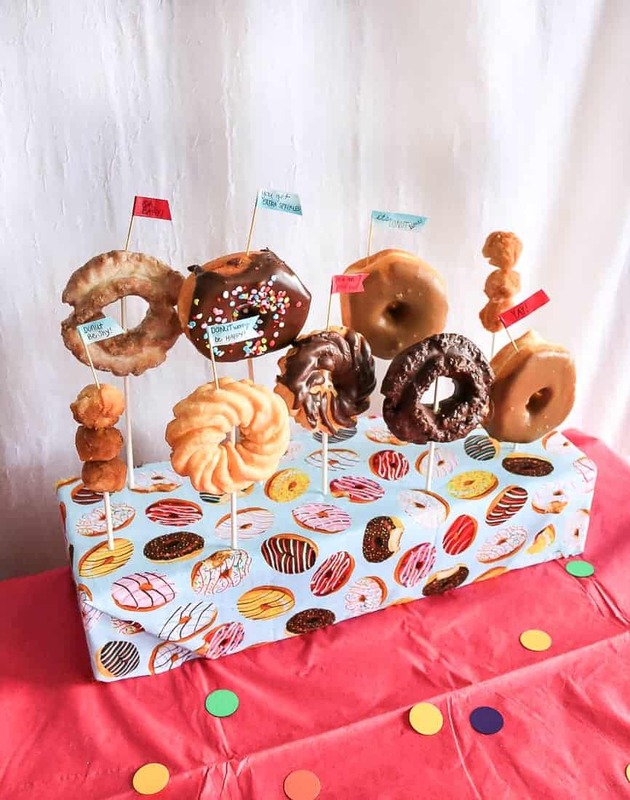 I made some adorable free printable donuts that I used in the backdrop of my table for the donut themed baby sprinkle shower. 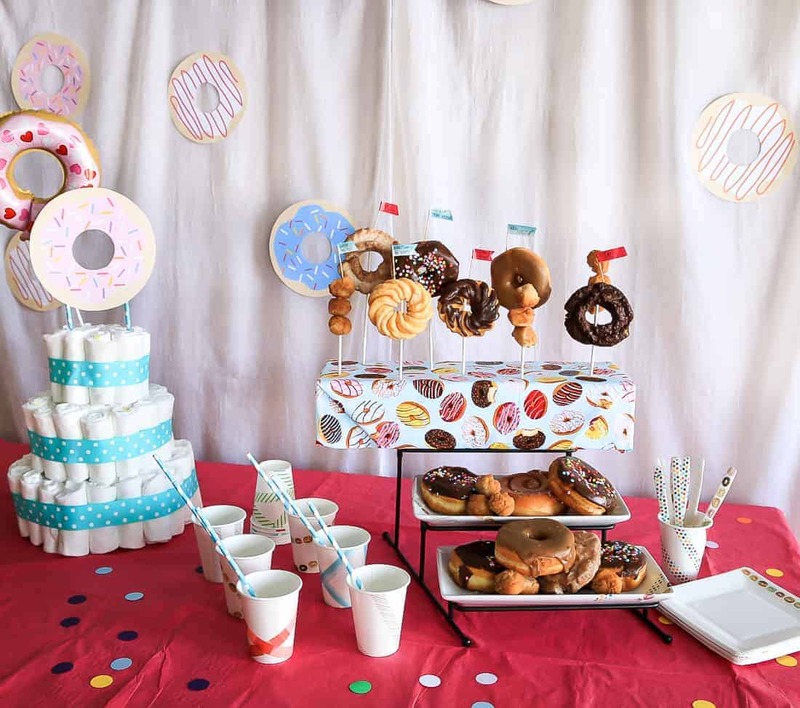 The printables really make setting up your own donut themed party easy! You just print and cut them out! If you’re wondering how to get these free printable donuts, keep reading! First of all, you may be wondering….what is a baby sprinkle? Baby sprinkles are common when you are pregnant with subsequent kiddos. They are called “sprinkles” because it’s not a full on traditional baby shower, but just a sprinkling of love. Baby sprinkles are typically smaller and possibly less formal than a baby shower and there’s definitely less presents because usually the moms have the essentials already. So, we knew we wanted to do a diaper shower, but of course I wanted a cute theme to plan the party around…and boom! Diapers and donuts! The ideas of baby sprinkle decorations started flowing and I knew it was going to be too cute! This baby sprinkle shower came together so easily. I kept things really simple because I knew it was going to be low key and laid back. These sprinkle baby shower ideas can be replicated on a budget and they don’t require a ton of time either! First, you need baby sprinkle invitations. As soon as we set the date for the sprinkle shower, I started thinking about the baby sprinkle invitations. I didn’t want to mess with printing and mailing invitations (what a hassle that can be), so I opted for digital invitations that you can send via email or text. 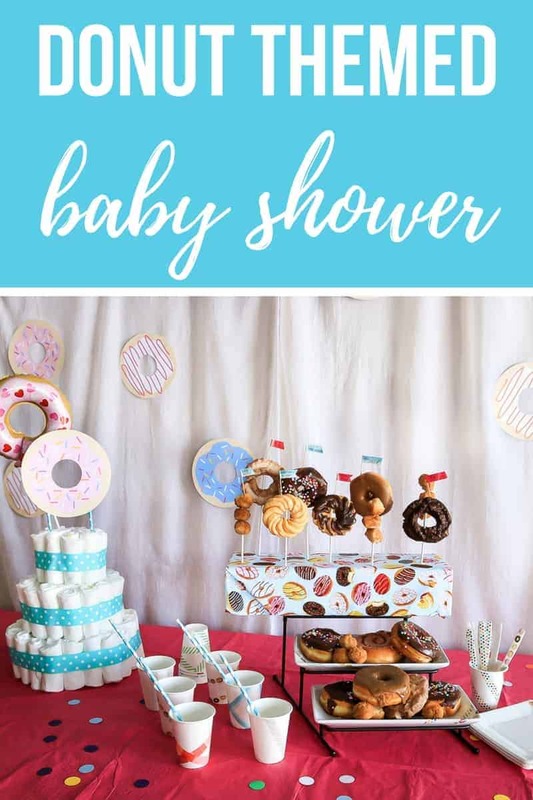 I found some adorable baby shower invitations while searching around on Evite and then stumbled across the most perfect donut baby shower invitations! It was totally meant to be. Within minutes I had the Evite invitation prepared and ready to send out to the guests. You just enter the emails or phone numbers and push send! When the RSVPs start coming back, there’s a really easy tracking tool built directly into the Evite website so you don’t have to keep track of the numbers on your own. 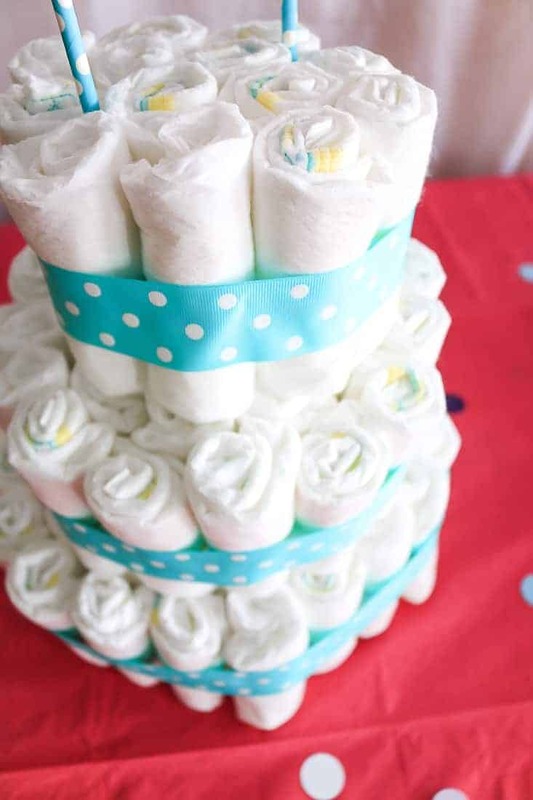 You can’t have a diaper baby shower without a diaper cake! Since I knew my sister needed diapers and lotsa diapers, I made this super fun diaper cake! It was incredibly easy and turned out so cute, don’t you think? It looked perfect on the table with the other sprinkle baby shower decorations. Don’t worry…there’s a full step by step tutorial coming your way soon on how to make a diaper cake, so stay tuned! Ready for a budget-friendly baby shower planning tip?? Serving a full meal to party guests can get complicated…not to mention, expensive! By hosting your baby shower (or really any type of event) at a time that is “in between” meals, you aren’t expected to provide a full meal. 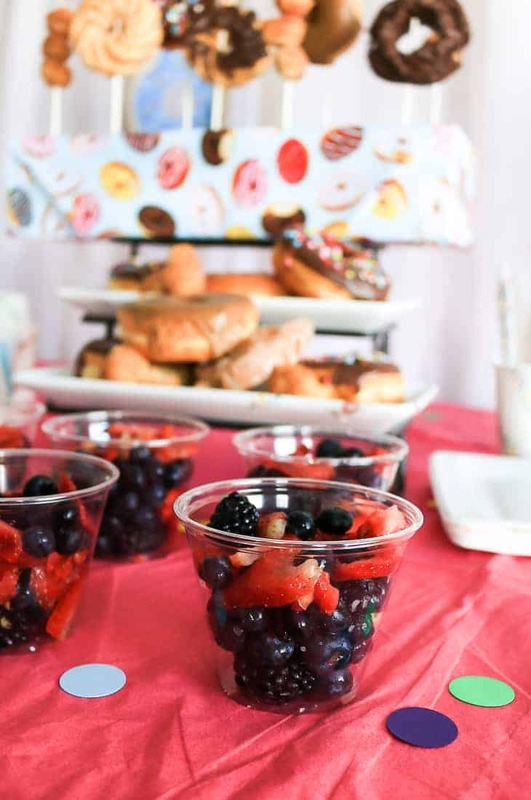 We had the party in the mid morning on a Saturday and served donuts, coffee, juice and berry fruit cups. Light and simple! 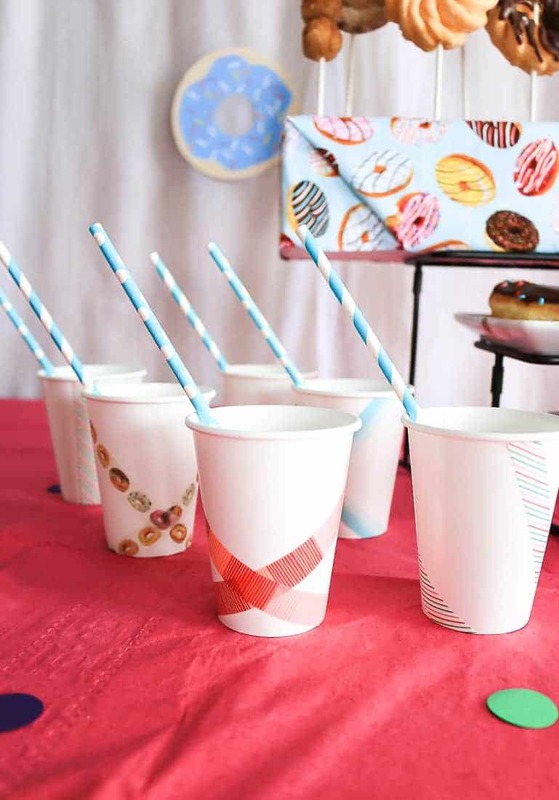 Washi tape is a simple way to add color to your party decorations. 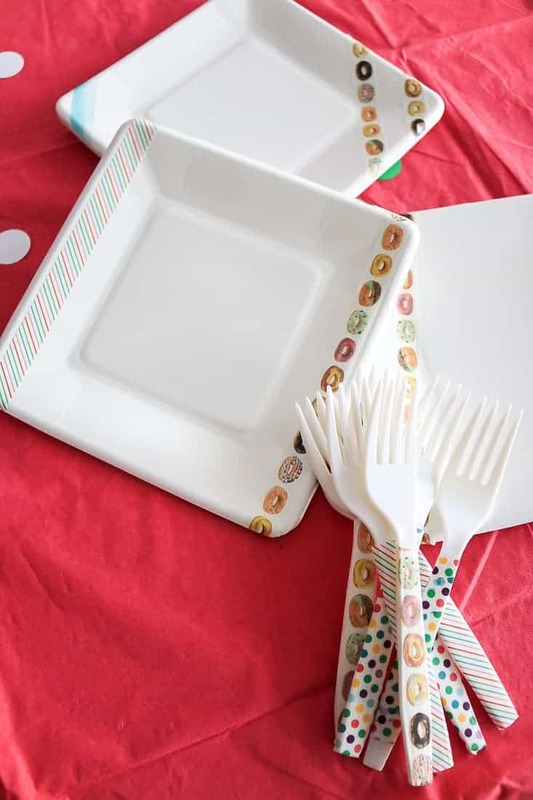 Incorporating washi tape is such a simple and budget friendly way to add vibrancy and color to your baby sprinkle decorations. I picked up some simple white square paper plates, white plastic cutlery and white paper cups for the party. Then, I simply added different patterns of washi tape that matched the bright color scheme of the party. I had fun putting the washi tape on the paperware in a random design. 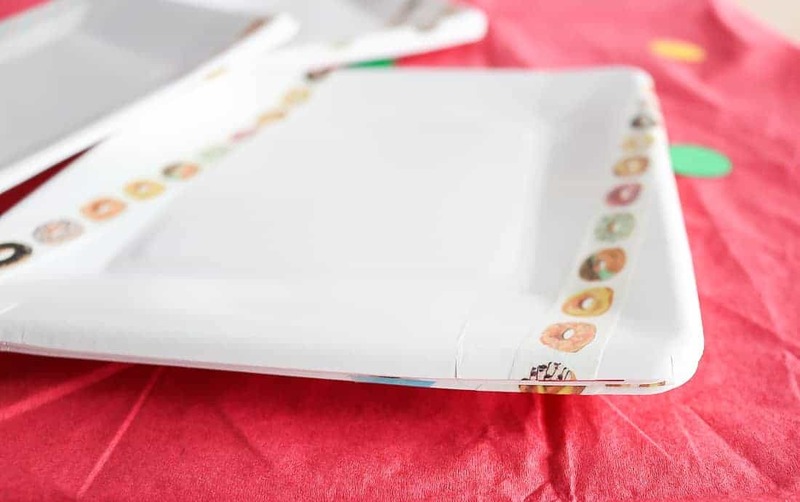 I even found some adorable donut patterned washi tape that was perfect! I also made some cute flags for the donuts on the donut stand with washi tape and toothpicks. 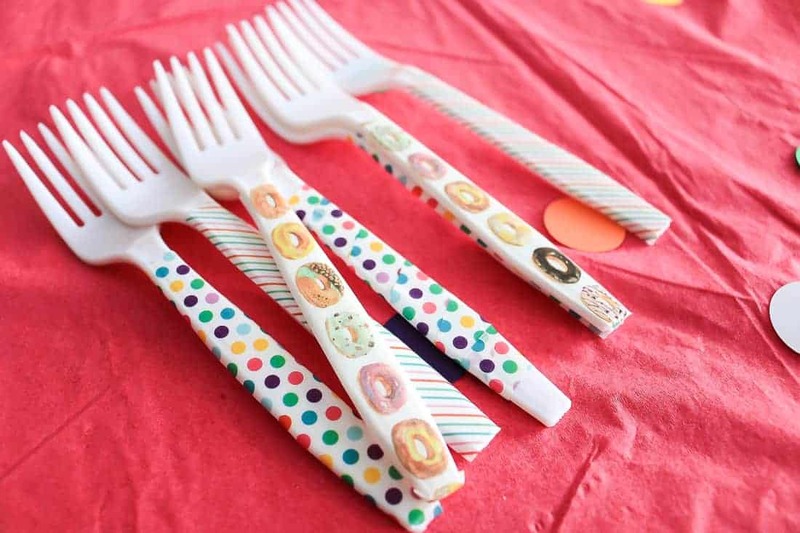 I just wrapped the washi tape around the top of the toothpicks and then wrote in some cute donut themed sayings. Speaking of that donut stand, isn’t it fun?? 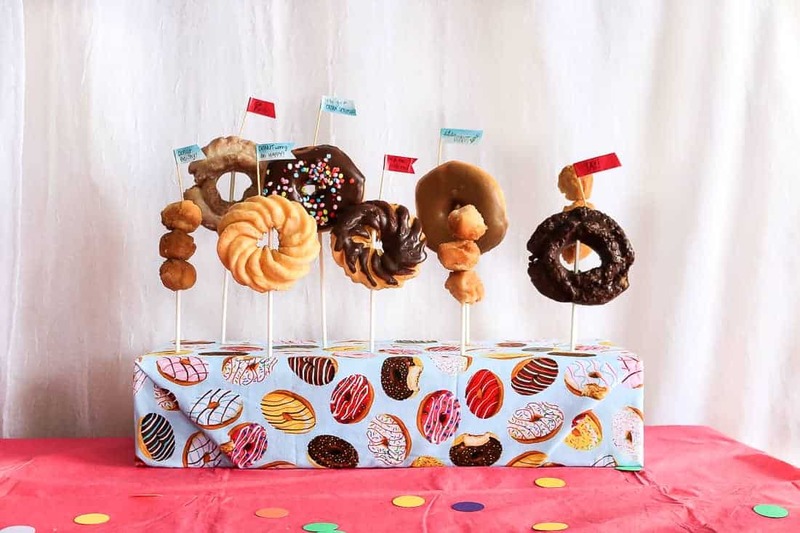 Stay tuned because in a few days I’ll be sharing the step by step tutorial for the DIY donut stand over at Evite Party Ideas. Now, let’s talk about those free printable donuts. 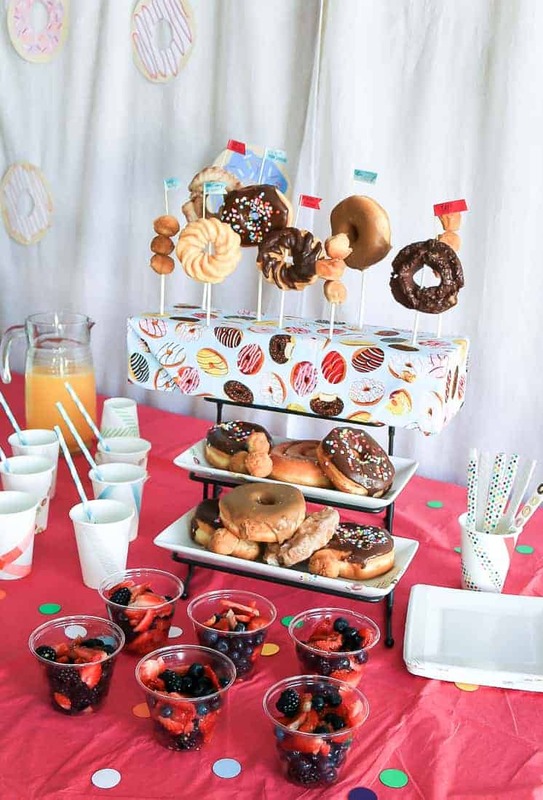 The printable donuts added a lot to the party decorations. I simply taped them to the backdrop of the table and then I also used one as a topper for the diaper cake. 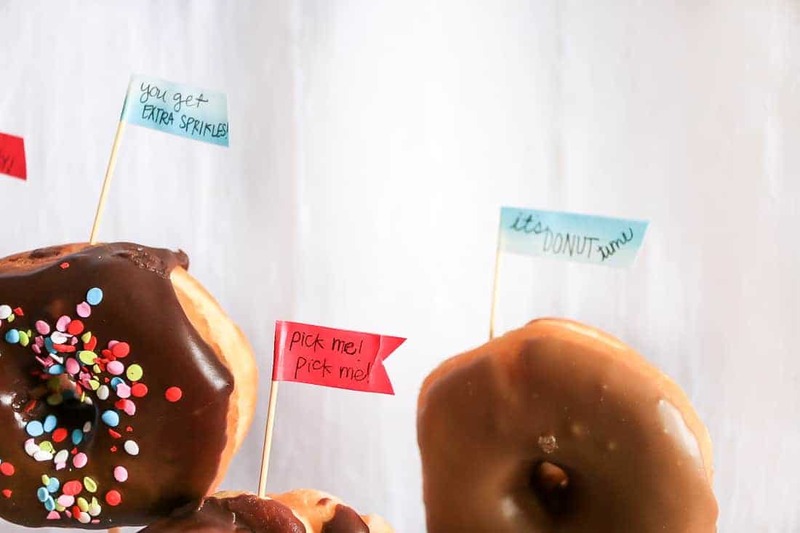 Now you’re probably wondering how you can get these free printable donuts for your own donut themed party….well, that part’s easy! All you have to do is enter your email address below and you’ll get a copy of the printables. We had so much fun at the donut themed baby sprinkle shower! These party decoration ideas are so simple that recreating your own donut themed party is easy. 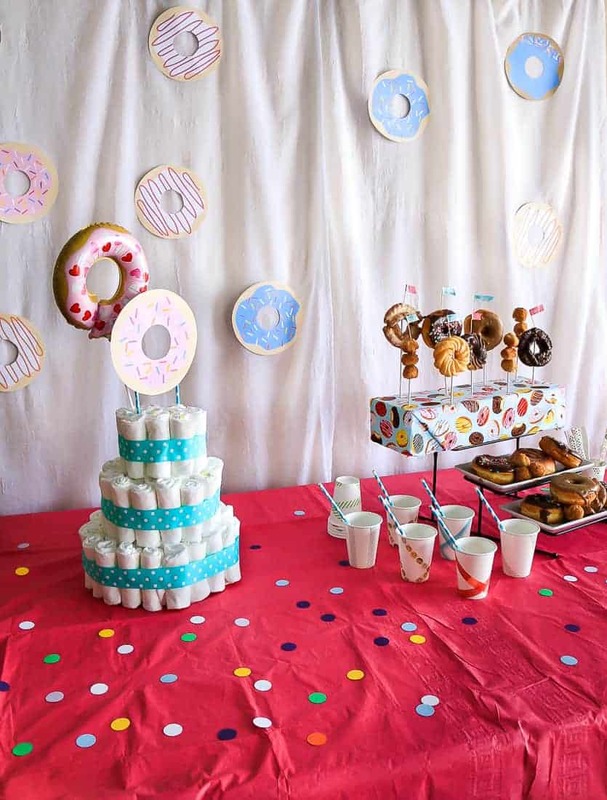 What is your favorite part about this donut themed baby sprinkle shower? Oh so cute Chelsea thanks so much for doing this for your sister!!! I so love the washi you used in items!!! 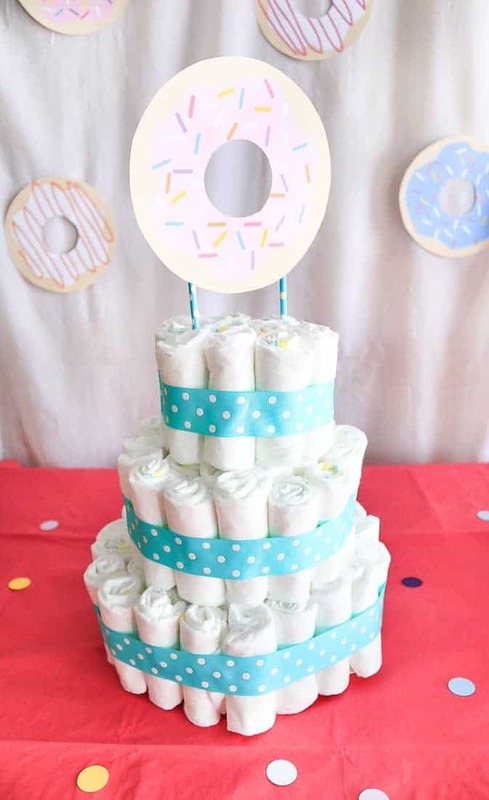 I love the idea of using a donut printable for the Diaper Cake. 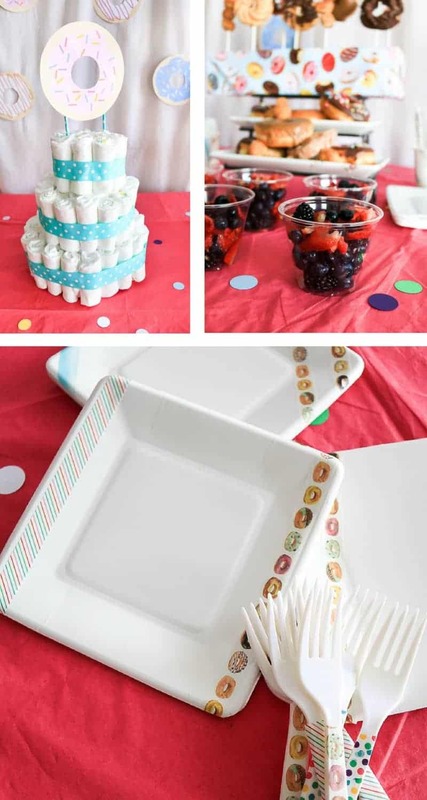 Such a cute way to make table decor that you don’t have to throw away after the party. Thanks!! I love how it turned out.